Missing NHL hockey this season? 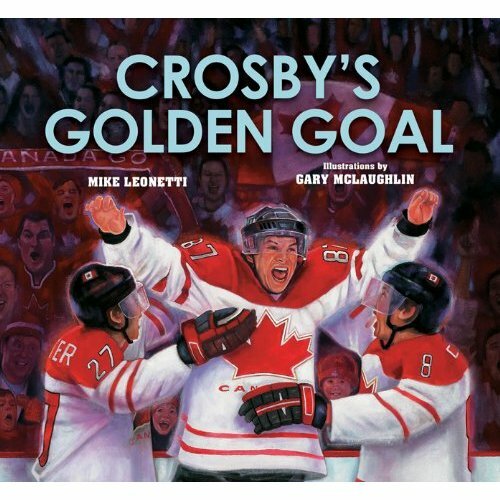 Maybe Mike Leonetti's newest release Crosby's Golden Goal will help you rediscover your love for the game, all while spending some quality time with the children. This book relives the excitement of Sidney Crosby's "golden goal" at the 2010 Winter Olympics through the eyes of a young hockey fan. Tyler has grown disheartened with hockey too, but for different reasons. But in this fine book he rediscovers the joy of hockey through Sidney Crosby''s famous gold medal goal. Tyler's life has always been about hockey: hockey after school, hockey on weekends, hockey on holidays... hockey, hockey, hockey. So his parents are surprised and disappointed when Tyler abandons the game he loved so much. But in 2010 the Winter Olympics come to Vancouver. The country is desperate to win a gold medal in hockey. "Sid the Kid" Crosby is leading the men''s team, and all of Canada is counting on him to help win the first gold in men''s hockey on home soil. Tyler''s dad gets tickets to the gold-medal game, and Tyler can barely contain himself while he watches the nail-biting final between Canada and the United States. Of course, Crosby scores the "golden goal" in one of the most exciting gold-medal games ever! Seeing the joy Sidney Crosby has for the game, Tyler decides to return to the ice and just take time to enjoy the sport he loves. This is just the latest in a long running series of children's books by Mike Leonetti. I use the term "children's book" loosely a little bit. Kids will love it, as will parents for that reason. But as an adult I adore these books. I have a huge collection of children's hockey books I'm just waiting to give to my new twin nephews, but the Leonetti hockey history series may just stay with me. I'll have to buy the twins new copies. Leonetti chose Gary McLaughlin to illustrate this book. Excellent choice. McLaughlin is a news worthy illustrator, famous for his 6x12 portrait depicting every single Toronto Maple Leafs player ever. It's a little different style of art as has been prominently featured in the series in the past, but it works brilliantly. I'm a huge fan of Leonetti's hockey history themed children's series. But this may be the biggest hit yet. Many of today's kids can actually relate to Sidney Crosby and his golden goal. They couldn't do that the same with Gordie Howe or Rocket Richard or Wayne Gretzky. That's why I think this book is a must have for the young hockey fan on your Christmas shopping list, as well as the for the parents!